There is no shortage of high-quality headphones catering for the audiophile more so than the gamer. This market is largely populated by brands that are not present in the traditional PC peripheral place. Names such as Grado, Sennheiser, Audio-Technica are mainstays. Looking to join them is San Diego-based 1More, whose ever-expanding portfolio includes gaming, in-ear and over-ear hifi options. The latter is solely represented by a triple-driver set known as H1707, available for around £180, which I have in for review today. First impressions are positive. The initial premium experience is achieved by 1More bundling in a high-quality hard case and vinyl bag. 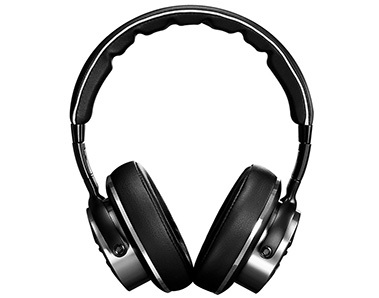 The headphones themselves fold via articulated sections on each side of the headband. Weighing in at 288g, portability is further enhanced by a detachable 135cm cable whose dual 2.5mm ends fit into each cup with a satisfying click. Wrapped in Kevlar for freedom from tangles, the other end of the copper, oxygen-free cable is regular 3.5mm, though the package includes a gold-plated 6.35mm adapter for serious hi-fi listening. And it's serious audio that is the name of the game, as the H1707 doesn't feature an in-line remote commonly seen on rival models. I'm not convinced that a clear focus on portability and a lack of remote make the best bedfellows. Build quality and aesthetics are both excellent, and better in person than the photos lead you to believe. Each earcup's external housing is finished with anodised aluminium that's home to a spun-metal finish that's great at keeping fingerprints at bay. 1More also offers these cans with a gold finish - right through to the trim on the earcups and headband - though I prefer the silver for a less ostentatious look. There's enough adjustment play between the steel headband and earcups to obtain a good fit. Being straight-up stereo headphones, there are no buttons or visual interruptions on each earcup save for the colour-coded cable entry points: red for right and white for left. Describing them as over-ear is not accurate, however, as the inner parts of cup cushions are rather small and sit on the edges of my ears rather than over them. They have the effect of softly squashing my earlobes against my head, and given the fairly tight grip, the overall fit is very much on the side of snug. So much so, in fact, that I need to take off the headphones before removing glasses. Contrary to those expectations, the H1707s, outfitted with PVC pads, are comfortable for long periods, at least for me, and I had no problem in listening for a straight 90 minutes without experiencing discomfort. However, a couple of test guinea pigs - wife and friend - reckoned they were a smidgen too tight. From using them as my daily listener for the past month, I'd recommend loosening the headband a notch or two more than you at first think; it aids comfort no end. Jumping over to the technology side, they're easy to drive with 32Ohm impedance and 104dB sensitivity, and an Honor 9 Lite had no problem in getting them pumping. They go satisfying loud and still maintain coherence, but there is a slight difference in perceived heft between running on a mobile phone and a dedicated hifi amp. 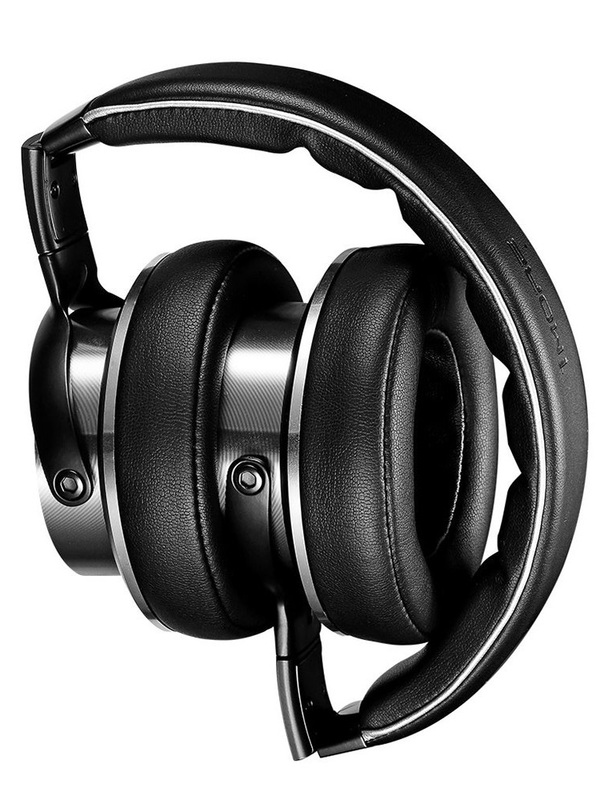 Being a closed-back design that envelops the ears means that others sat near you won't be overly distracted by mid-volume audio. There's some sound leakage, of course, but I'd classify the H1707s as at least average in this regard. Certainly nothing to worry about if on the Tube. 1More is taking a descriptive liberty by calling the headphones a triple-driver speaker. There's a forward-firing ceramic tweeter, a main 40mm driver and a third that is labelled as bass reflector. This isn't a driver in the traditional sense of the word; I'd say it's actually a passive radiator that facilitates enhanced bass reproduction. After a solid amount of time spent on burn-in, the H1707s produce an audio profile that is more pleasing and agreeable than super-accurate and neutral. Let me expand upon this. The first aspect you notice is that the bass response is set to be fuller and more impactful than on, say, my reference Sony MDR-1700 headphones. That's not to say it is bad and woolly, which is an affliction commonly found on cheaper 'phones. There's just more bass than I would expect when playing select tunes from Massive Attack and the Lumineers. This bass preponderance leads to the mid-range taking more of a backseat than on a friend's Audio-Technica ATH-M40X cans. The treble, meanwhile, lacks ultimate refinement but makes up for it by surprisingly good separation from the mid-range and bass. In fact, it feels as if it is coming from right in front of you rather than around you, enabling you to pick out instruments and higher-end vocals easily. What I believe 1More's going for is immersion and fun over absolute reference accuracy. 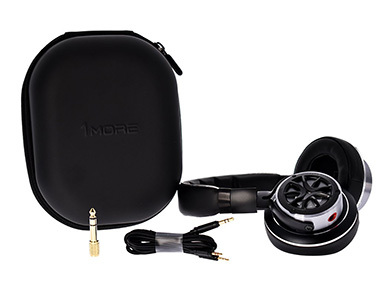 The combination of punchy bass, recessed mid-range and sharp treble leads to a sound that is enjoyable to listen to, trumping cheaper headphones by maintaining clarity across the frequency spectrum. It's telling that fellow testers used adjectives such as pleasant, immersive, fun, roomy rather than neutral and super-accurate. I have no problem with that; it's the sound 1More is striving for. Where this signature really works, actually, is when listening to movies. The H1707s are impressive at conveying dialogue and scale in equal measure, and I found the forward treble to work a treat in generating the right soundstage. As it's more in front of you than around, which is exactly what movies need, it sounds wonderful in key scenes during the most tense moments of Interstellar - you know, where the two ships are trying to dock! 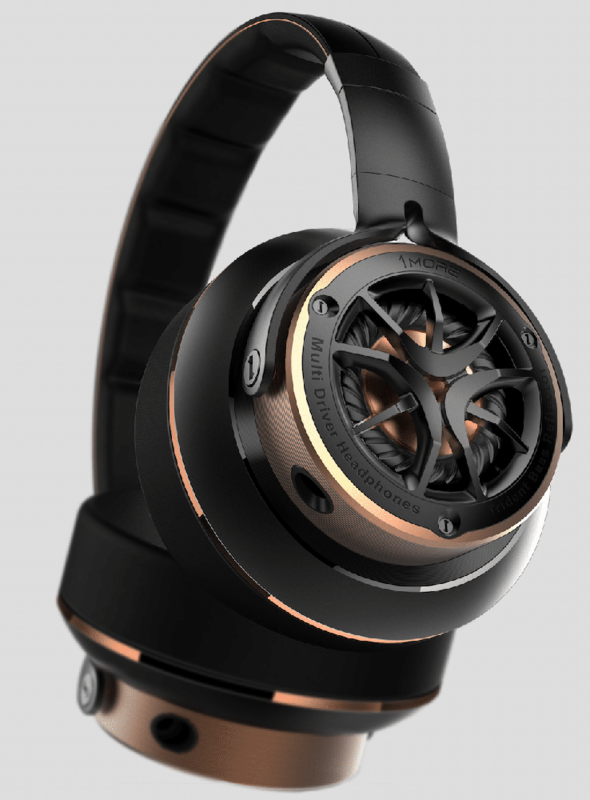 Priced at £180, 1More's H1707 over-ear headphones fit the bill from an aesthetic and build viewpoint. Eschewing garish colour schemes and opting for a minimalist look does them style favours, and I'd imagine that passers-by will wonder exactly which cans you have on. Offering a snug fit, perhaps too snug for some, there's minor sound leakage that's acceptable for everyday use. Cabling is mostly decent, though I'd encourage 1More to have a model with an in line remote, while packaging is excellent. Most importantly, sound quality is best described as immersive and fun rather than refined and accurate. There are more neutral music headphones available for the same money - Sennheiser Momentum 2.0 spring to mind - but if you like your audio strong and visceral, the H1707s are a good shout. They work particularly well for movies thanks to a forward soundstage, so they're good at a lot of things without being truly excellent in any one area. I'd recommend putting the 1More H1707 triple-driver, over-ear cans on your listening shortlist, but given the industry's move to wireless, wouldn't it be nice if they were cable-free, too? I use Beyerdynamic MMX 300 Gen 1 for gaming, really great headset paired with a Sound BlasterX AE-5, would never go back to “gaming” headsets. Personally, I'd buy audiophile headphones for listening to music, and reserve the “fun and immersive” type of gaming. In fact, I did. 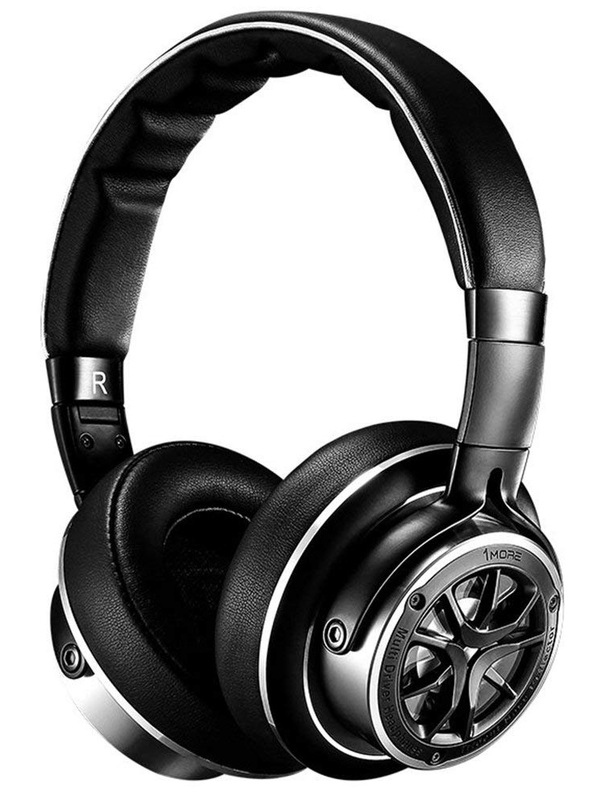 For music, my “audiophile” phones are Stax Electrostatics, and a pair of Sennheisers (at just a bit above this price point) for more everyday use. Gaming? A decent gaming-grade amp and speakers, but that's not where my priority lies. 1More have a big job on their hands because, again personally, I would take some convincing to look at anything other than traditional brands (Grado, Senn, AT etc) for audio use, and unless these were a lot cheaper, so unless they hold their isn compared to say £300 models from those brands, I'd need convincing to even give them a chance. I suspect many ‘audiophile’ (don't like that sord, it has snobby connotations) users would be the same. Secondly, I have to like the sound. And that, as any serioys music fan knows, is very subjective. Two serious audiophiles can disagree over tje ‘best’ speakers or headphones simply because they prefer one sound profile over another.